In the demo area which Verizon and Apple opened up after their Verizon iPhone 4 unveiling today, we got some hands-on time with the actual device. As we were told during the event, the device is largely the same as the iPhone 4 on AT&T’s network, with some slight changes to the antenna on the side. And there’s one more thing: the Verizon iPhone is running an unreleased version of iOS. Verzion 4.2.5 (8E128), to be exact. Not that this should be surprising. The Verizon iPhone comes with one very key and very killer difference than the AT&T iPhone: Personal Hotspots. In order to use this new feature, clearly there’s a need for modified software. 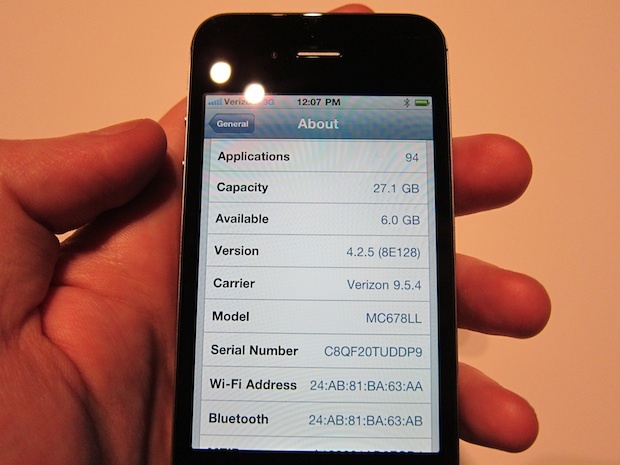 And that software, iOS 4.2.5, will presumably launch alongside the Verizon iPhone on February 3. One question is if the AT&T iPhone 4 will also get an upgrade to iOS 4.2.5 at that time, or if it will be Verizon-only? Maybe the two will merge again with iOS 4.3. Or — wait for it — iOS 5.